As river and ocean trade grew, so did Yangon. Historically, industrial port facilities have lined much of Strand Road and sealed off the waterfront from residents. This remains the case today, save for a couple of public access points. With competing visions for riverside development, many hope to see it opened up. Yangon is within easy access of the Ayeyarwady River, navigable almost as far as the Chinese border 1,400 kilometres north. Only 50 kilometres south, the Yangon River enters the Bay of Bengal and the Andaman Sea; its location was precisely why Yangon became Myanmar’s port for river and ocean trade. The country’s teak, petroleum products and rice passed through here. Harbour cranes loaded the goods on freighters from the many quays. But it wasn’t just trade that kept the port buzzing: the city’s growth in the late 19th and early 20th century relied on one of the largest-ever waves of labour migration, chiefly from India. The overwhelming majority of these migrants landed at Yangon’s port, in numbers at times exceeding those arriving in New York City. An 1852 plan designated Strand Road as the southern limit of Rangoon. It allowed ample space along the shore for future developments. Over the years, growing colonial trade led to an expansion of local facilities. 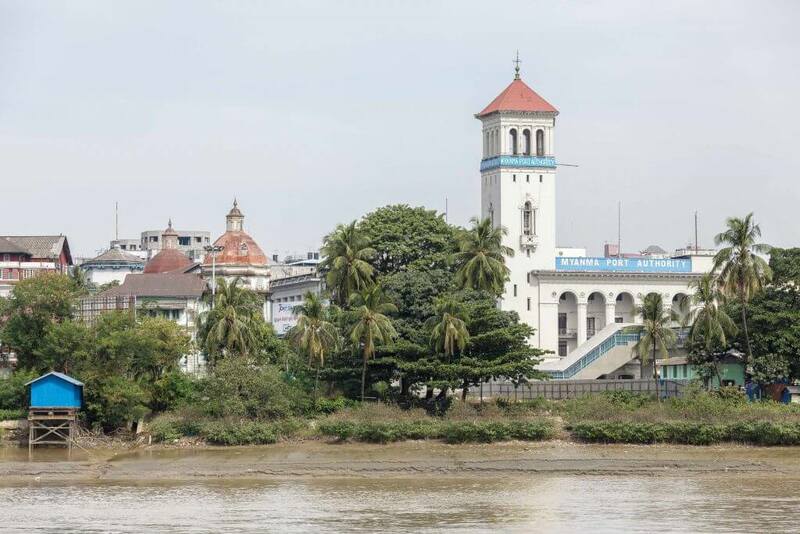 The Pazundaung Creek in the east housed numerous rice mills, while much of the wide, south-facing riverfront became wharfs, such as at the southern end of Sule Pagoda Road. Farther to the west, a large number of sawmills processed Burmese teak and prepared it for export. In an age before mechanisation, skilled handlers directed an army of elephants as they carried large shipments. The Yangon River is too shallow to accommodate today’s large container vessels. The special economic zone (SEZ) in Thilawa, some 15 kilometres downstream, will provide relief to Yangon’s port once fully operational. However, there are no plans to fully abandon port facilities in the city, as river trade remains important to the local economy. Sizeable investments in facilities have occurred in recent years, for example at the Myanmar Industrial Port in Ahlone Township. There are large port areas further up the Yangon River. Roaring truck traffic along Strand Road is visible proof of this: in order to ease access to the port, it is now partly a toll road. 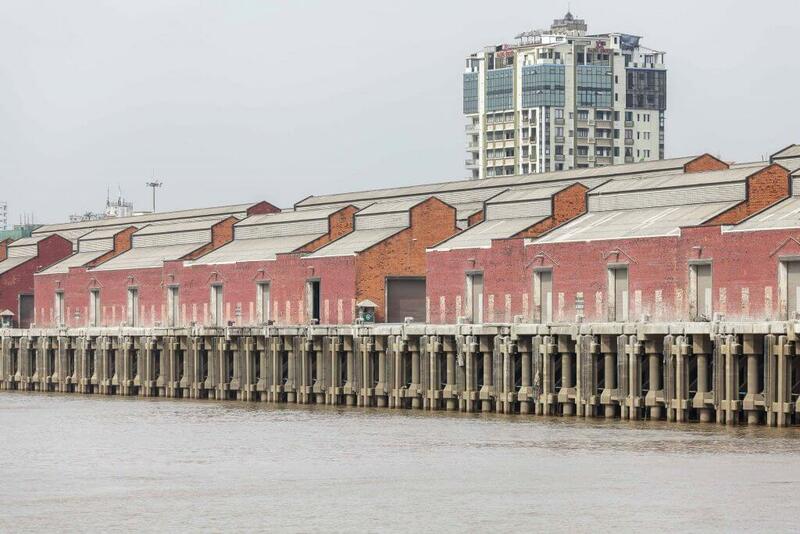 The modernisation of Yangon’s port facilities and the construction of the Thilawa SEZ could provide a unique chance to dispense with some of the industrial facilities closer to the city’s historic centre, primarily between the Wadan Jetty in the west (close to the Transit Shed No. 1) and Botataung Pagoda in the east. 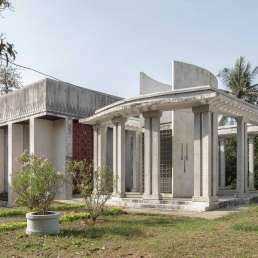 However there are competing visions and sources of power to reckon with: in December 2013 it emerged that the plans of the municipal authority, the Yangon City Development Committee (YCDC), clashed with those of the Myanmar Port Authority (MPA) which administers much of the waterfront. 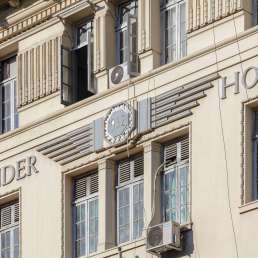 Its manager told The Myanmar Times that they planned to build a “20-floor office block, a 16-storey hotel, a four-storey shopping mall and a three-storey cruise and ferry terminal” as well as “four floating hotels”. By contrast, the YCDC is keen to redevelop the waterfront to include green, public park areas. At the moment, access to the water is limited to the ferry jetties. 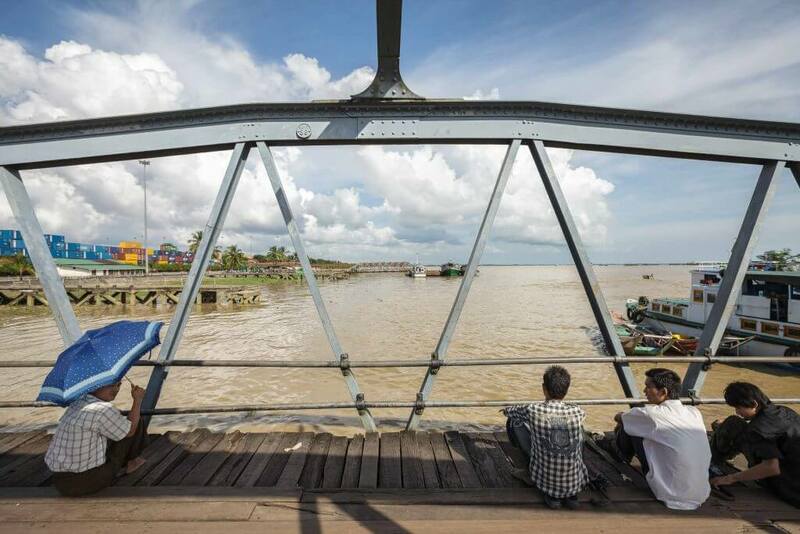 In the absence of a bridge crossing to Dala on the opposite banks, Yangon will continue to rely on ferries bringing passengers—many of them commuters—between the two shores. 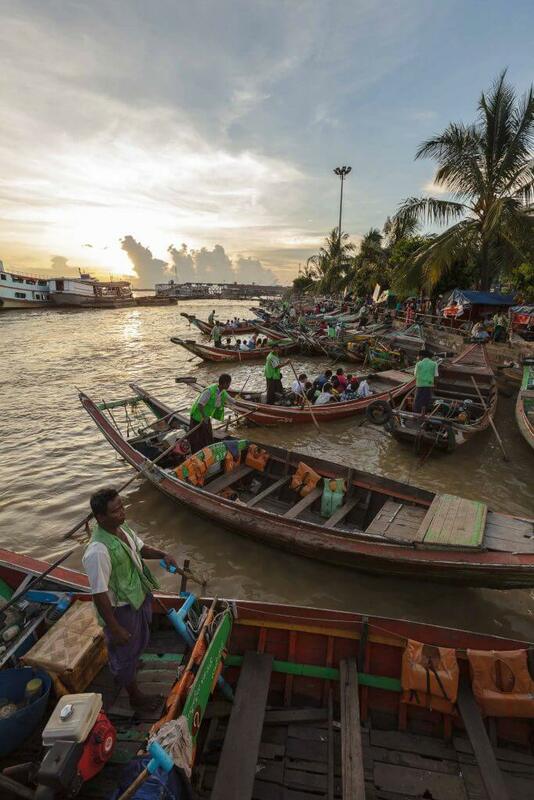 Those jetties, primarily Wadan, Nan Thida, Pansodan and Botataung, are lively public spaces. Low-key football games and conversations peter out as the sun sets. 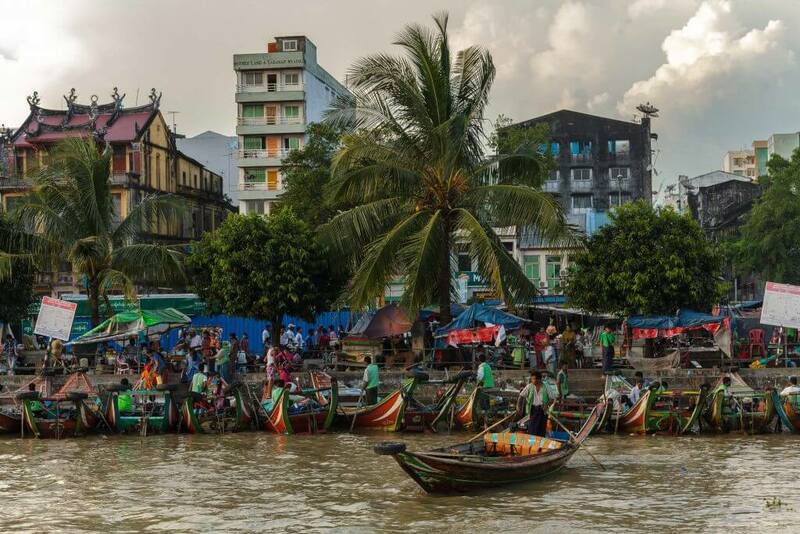 Yangon will gain from turning more areas into public spaces, especially on the waterfront. 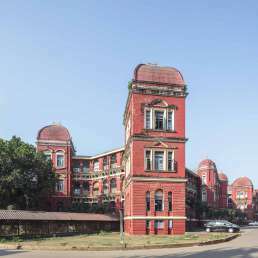 As the downtown area is by and large built-up, part of this land could be converted into a park—as the Yangon Heritage Trust suggests. The stretch of historic buildings in this part of the city also offers the chance to create a recognisable skyline if the view becomes unobstructed. Finally, old port infrastructure could be converted and adapted for new uses, such as mixed-use commercial, residential and public open space. The old Sule Pagoda wharfs, in particular, would lend themselves to that purpose. 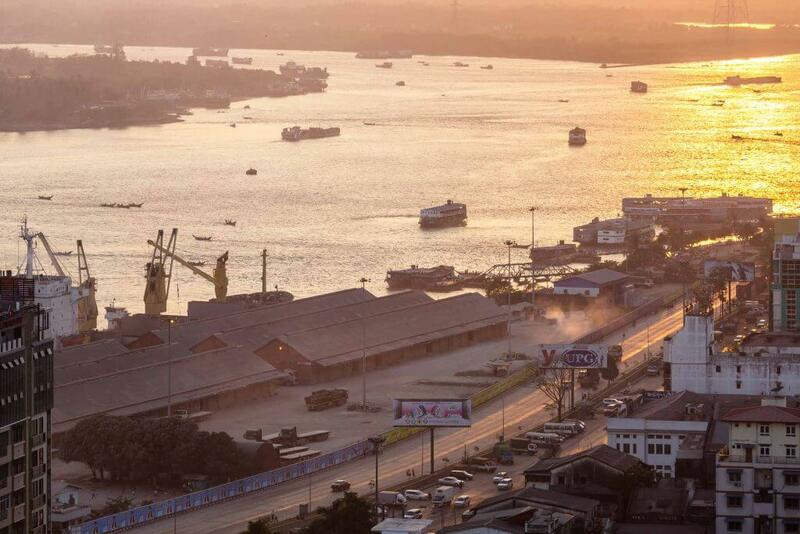 However, the opening of the waterfront also depends on the role of Strand Road in Yangon’s future transport grid. YCDC plans, mentioned in this book’s section on urban planning on page 206, foresee a flyover serving as the southern perimeter of Yangon’s central ring road. It is hard to argue with the YCDC rationale: Strand Road is already gridlocked at rush hour. However the YHT and other conservation-minded organisations object to these plans, preferring a less car-heavy model. Encouragingly, a tram service, which first operated between 1884 and the Second World War, resumed along Strand Road in 2014, pointing to the potential for public transportation. An alternative to a flyover would be a tunnel along the street. However, Yangon’s marshy foundation would present a hugely expensive engineering challenge for a project of that scale. The highly anticipated new zoning regulations for the downtown area will have consequences for the waterfront, too. 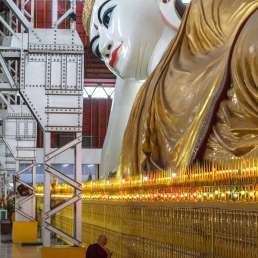 In all likelihood, these will restrict the permissible building height and ensure that the Shwedagon Pagoda continues to tower visibly over the city. 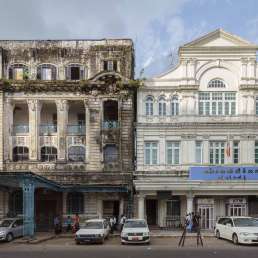 To imagine its future waterfront, there are many case studies Yangon can draw upon. In the late 20th and early 21st centuries, many cities have made it a priority to reintegrate their waterfronts into daily civic life. They have come to recognise the waterfront as a significant asset of their particular urban geographies. The redevelopment of Hamburg’s HafenCity, Buenos Aires’ Puerto Madero or London’s Docklands may be of limited use, due to their profound social and economic differences to Yangon—and yet they do sound some warning bells, too: all three cases have led to unbridled gentrification, where private property developers were given free rein to devise lucrative building complexes, sometimes at the expense of the public good. And while these projects contain large, publicly accessible parks, their proximity to affluent residential zones, high-end hotels and grade-A offices have made them less popular with the cities’ poorer populations. Lastly, plans for the flyover could also heed lessons from elsewhere: in the US, Robert Moses’ New York City highways over the Hudson and the East River sides of Manhattan are a solemn reminder of the long-term effects of master planning. To this day, large swathes of Manhattan’s waterfront remain inaccessible. Elsewhere, and equally controversially, the highways brutally cut through some of New York City’s poorest neighbourhoods, which further worsened living conditions for the largely African–American residents there. And San Francisco’s demolished Embarcadero Skyway reminds us that transportation infrastructure does not need to be permanent. The question is: how long will Yangon’s residents have to wait before they can make the most of their waterfront, and at what expense? “Studio Yangon” project description, Hong Kong University, 2014.